Major League Baseball history was made in 1974. It wasn’t made by a World Series-deciding play at the plate or even a record-breaking event. History was made off the field when Tommy John, the then left-handed pitcher for the Los Angeles Dodgers, became the first person to have ulnar collateral ligament (UCL) reconstruction surgery by orthopaedic surgeon Frank Jobe. This surgery eventually came to be known as Tommy John Surgery or T.J. as it is called in the sporting circles. This article is not about the surgery itself but rather the career-extending effect that it had on Tommy John’s career and the competitive breath of life that it has given baseball players and throwers. From a mechanical vantage point, Tommy had to change his throwing mechanics, not just for rehabilitation purposes, but to also relieve the stress on his throwing arm, enabling him to continue his career with the 1976 season and beyond (to 1989!). Research is inconclusive towards any one factor that contributes to the stress and eventual injury and tear of the UCL. The factors vary with point of views, including different angles with pitching mechanics, pitch count, innings pitched, type of pitch, velocity of pitch and rest between outings. Rotator cuff endurance and postural endurance can also be added to the list of factors. Although there remains no need to exceed norms, it is important to determine any lack in range of motion or comparable deficiencies in the respective joints. Creating the ideal shoulder and elbow care plan for a throwing athlete means first starting with a comprehensive movement assessment. This may begin with a single assessment such as the Overhead Squat Assessment (OHSA). This assessment can sometimes be deceiving with the simplicity of application for a thrower. However, if the compensations are identified, the deficiencies in the previously listed joints can be addressed and integrated into a corrective exercise strategy at minimum. Opposite foot, knee and hip mechanics are needed for the lead, landing foot as the pitcher strides towards home plate. Low back arch and forward lean reflect a lack of strength in the hips and spine necessary for ideal posture to keep head, neck and shoulders in position. 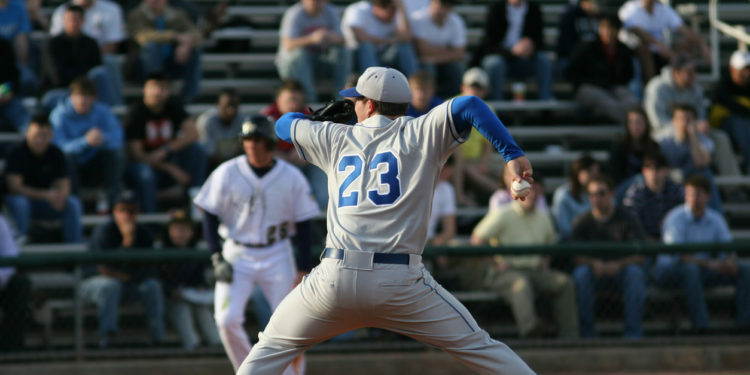 Arms falling forward may reflect a lack of shoulder flexion required to keep an efficient arm angle as the pitcher throws within the strike zone. A fault in any one of these joints will have an influence on all other joints involved in the throwing motion. The baseball pitcher specific program is multifaceted especially when it comes to their various needs. These needs include flexibility and optimal range of motion, balance, stabilization for impact, strength and power for speed of delivery, coordination, timing and postural endurance for multiple innings. The baseball season can be as short as five months or go as long as year round. Maintaining all the physical assets for the sport requires constant monitoring and assessing of all joints. The more frequent the assessments the better the likelihood of preventng the development of compensations or, at the very least, maintenance of muscular symmetry. Presenting a conditioning plan that considers both the needs of the individual and the demands of the sport.